The family’s experience with connective tissue conditions began in 2001, before Tracy and Chris Snyder were even married. Chris’ father passed away on Thanksgiving day from what was later determined to be an aortic dissection. Four years later, Tracy’s father also passed away from an aortic dissection. The coroner suggested the family look into Marfan. In 2005, AvaLynn was born. After several months of ear infections and difficulty with nursing, Ava was given a cleft palate diagnosis. She underwent corrective surgery at 16 months old, but Tracy was still noticing lots of other unsettling things. Ava had frequent urinary tract infections and fevers, and her little body would “snap, crackle, and pop” during routine movements like diaper changes. Two years later, Olivia made her way into the world. As she cried and nursed, her palate opened up, putting Olivia on a path of recurrent ear infections and tubes, just like her older sister. The whole family hated the routine of ear drops that came with the constant ear infections. The girls would scream and cry. Ava, who was able to talk by this time, would say her eye hurt from the ear drops. It turned out that the ear drops they were both prescribed were flagged as problematic for people with connective tissue conditions, but the Snyders and the girls' doctors hadn't yet made those connections. At age four, Ava tested negative for Marfan syndrome, a possibility Tracy and Chris had kept in the back of their minds since the conversation with the county coroner years before. Her negative test, exceptional height, and hypermobility left Ava with an “unspecified connective tissue disorder.” Olivia went undiagnosed for a while longer after being dismissed for testing because she did not present classic outward signs of a connective tissue condition. But Tracy was 100% convinced there was something more. Pulling together the medical history and physical characteristics of both the girls’ grandfathers, Tracy headed for the internet. 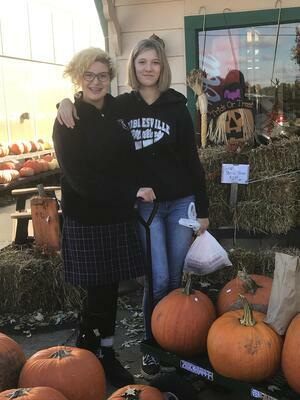 Thanks to online scholarly articles and information on The Marfan Foundation website, she started to connect the dots herself. She called the Foundation’s Help and Resource Center to talk with the nurse on staff, a connection that would turn out to be life-saving. On this call, Tracy learned about the Foundation’s Annual Conference and the accompanying health clinic. The family immediately made plans to head to the conference that summer, which was hosted by Mayo Clinic in Rochester, MN. The Snyders first stop at the conference clinic was for echocardiograms. When Tracy and Chris reconnected after testing, Tracy saw that Chris' face was drained of all color. She immediately thought something was wrong with the girls, but it turned out that Chris’ aneurysm was the same size of his dad’s at the time of his death. The clinic doctors, who happened to include Dr. Bart Loeys, spent hours with the family and gave a clinical diagnosis to all three – Chris, Ava, and Olivia – of Loeys-Dietz syndrome. Through this connection with The Marfan Foundation, Chris would go on to receive a genetic diagnosis from Dr. Loeys himself. 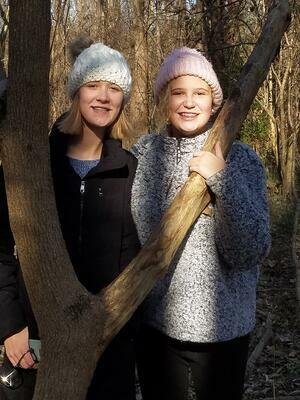 The LDS diagnosis brought peace to a family full of confounding symptoms. They had known all along that something was not right and a veil of uncertainty was lifted with the clinical diagnosis. A year later, Chris underwent valve-sparing root replacement surgery and all three are under medical care that the family credits as a direct result of Marfan Foundation research. Olivia is 11 now. She is bouncy and outgoing. She loves to sing and is exploring possible athletic opportunities that are safe for her. She has the support of her medical team and the pipeline of information to which they are now connected. Ava, now 13, is an artist. She has been drawing since she could hold a pencil and is aspiring to become an architectural designer so she can restore historic homes. She is inspired to help people who have to live in run-down apartments and wants to make them beautiful for anyone who lives there. They now have a team of skilled caregivers and close friends in the Marfan and related conditions community who have added importance as the girls build their own networks of support. The Snyder family's story spans three generations and, because of the right medical information at the right times, their close family connections continue. The connections they made through The Marfan Foundation caught a potentially fatal issue for Chris and gave each family member the gift of life. 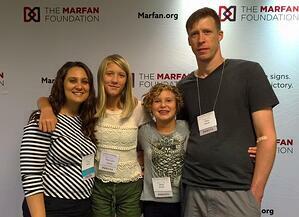 Victory stories like the Snyder’s are why your support of The Marfan Foundation is quite literally life-saving. Your gift means that vital connections between education and caregivers will continue to expand for families whose lives depend on it. Make a gift to The Marfan Foundation this Giving Tuesday to continue the line of connections that, every year, save the lives of people living with Marfan and related conditions.